The scene opens at the end of the 19th century. The Château of Amboise rises through a misty nightscape of interlace swirls, like the wandering shadow of a past full of buried splendour. Silhouettes glimpsed in the maze-like scene move stealthily along the wooden scaffolding that is part of the vast renovation works recently begun around the building. As often happens, drawn in by the awe-inspiring remains of the castle that act as guardians of its centuries-old history, a few children have disobeyed their parents and have come here to dream of battles and valiant knights and conquests. Suddenly, there is a cry : one of the little group of adventurers has just bumped into one of the beams of the construction works. He falls backwards in a daze as his playmates mockingly compare him to the unfortunate Charles VIII who, 400 years before, died tragically on this exact spot. Then suddenly, the storytelling plunges back to historic times : to the Court of Charles VIII. The chidren's dreams become strangely real and resurrect, in full view of the amazed spectators, the pomp and plots of the Royal Court at the dawn of the French Renaissance. In the shadows is Louise de Savoie, a woman working secretly to see that the great royal destiny promised to her son by a mysterious hermit should come about - the accession to the throne of Francois I is soon to become reality ! 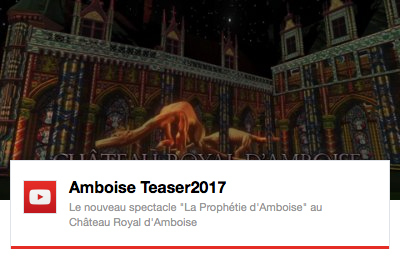 Though centuries apart, "The Amboise Prophecy" alternates from one era (the 1900's) to another (that of Louise de Savoie), pushing back the known limits of light & sound spectaculars in a magical combination of multimedia arrangements and epic scenes. The completely new show created by Animation Renaissance Amboise transports the spectators into an innovative multi-sensorial arena of dazzling images, optical illusions and special effects that interact with over 250 performers on stage.